Coupons.com asked us to share our best Back to School hacks – or easy short cuts – as we prep to send our boys to school next month. Usually the biggest Back to School expense can be the wardrobe, so here are our best Back to School Wardrobe Hacks to help you make the most of the clothing you have, and create some new-to-you pieces before the bell rings. Be sure to check out Coupons.com for instant access to all the best sales online and their back to school hacks series as well, it’s sure to be full of great short cuts! 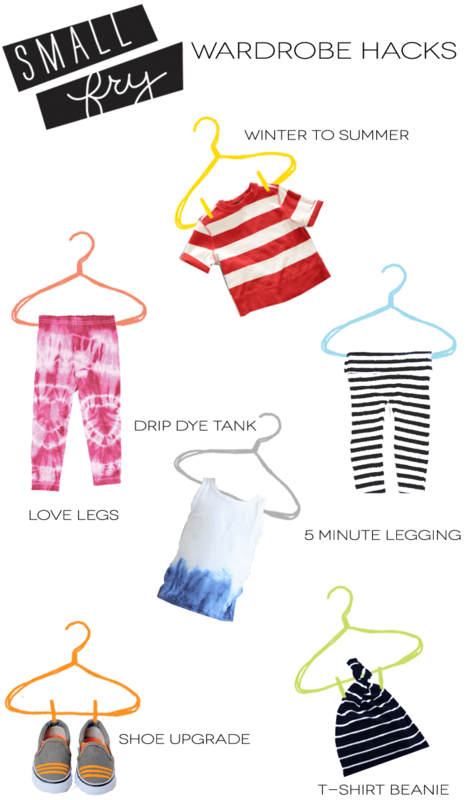 Make simple cuts to transform too-short long sleeves and hems into cute cut-offs [HERE], tie-dye leggings, tees, and more (we even found a way to create the heart shape seen above) [HERE]. The Pin seen round the world – our five minute five step leggings made out of body-con skirts [HERE]. Dip-dyeing techniques to add a little extra interest to shirts [HERE]. Make beanies for the colder months, or a bad hair day from an old t-shirt [HERE], and you can even add paint to a favorite pair of canvas sneakers [HERE]. Even more not pictured: Stamped Pants and Easy Patched Leggings. The Alison Show’s Tiny Harem Pants pattern and tutorial [HERE]. A T-shirt to Dress refashion via Create and Delegate [HERE]. The most darling water color effect sneakers known to man via Jen Loves Kev [HERE]. What wardrobe hacks have you tried and loved? Leave links in the comments and we’ll be sure to add them to this post! These are such good ideas, thanks for sharing!